Honestly. It was just a quick trip to the post office! Up at dawn, I had spent a bit of time writing three short letters to family and friends. It was such fun to tuck lots of recent photos into each envelope. Naturally, I couldn’t wait to drop all of this happy mail into the big, blue mailbox in front of the post office! 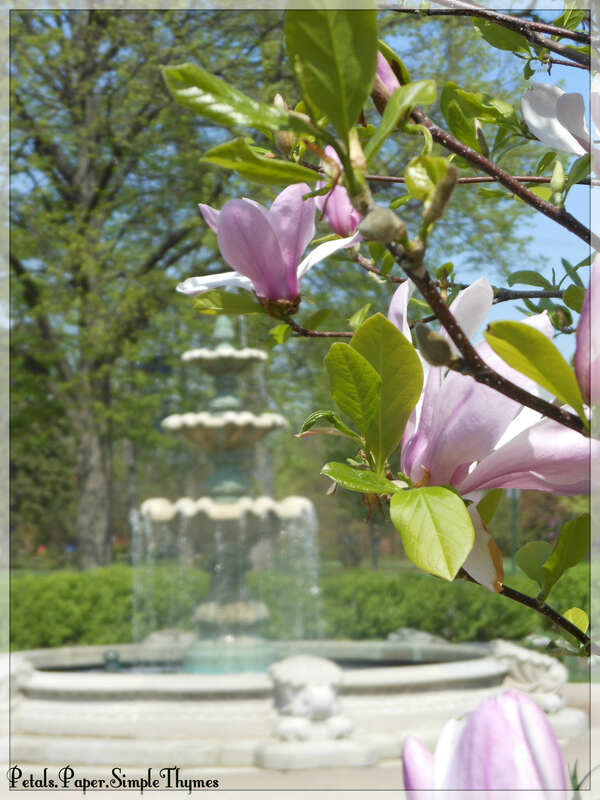 Our post office is located next to a lovely park ~ a park just filled with Spring color on a beautiful morning in May. What is a letter-writing, flower-loving, park-walking girl to do during her favorite month of the year? 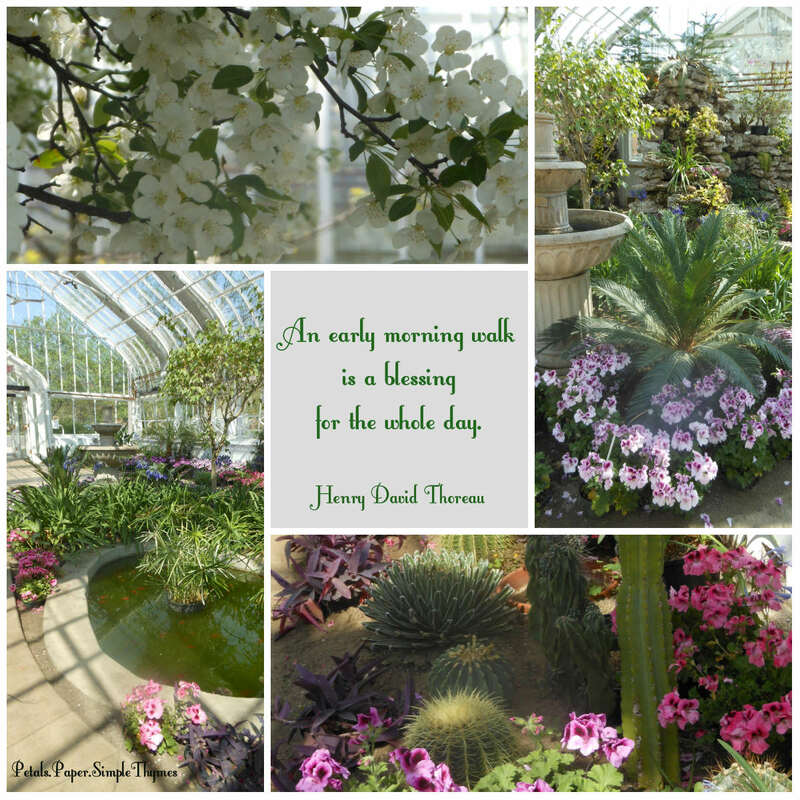 Happily, I still had my camera in my small backpack, so now we can take a little morning walk together… I peeked into the Conservatory first. Spring flowering plants surrounded the fountain and the goldfish pond. They were even tucked in amongst the cacti. What a study in contrasts, seeing the soft geranium petals against the spiky needles of these desert plants. The bright morning sunshine streamed in through the glass panes, filling the entire space with quiet warmth. Silent, except for the soft bubbling of the pond. I felt completely ‘present’ ~ mindful of the colorful flowers, the sweet scents, the warm, humid air, and stillness all around me. being mindful of everything around me. The flowering trees in the park are were just breathtaking! 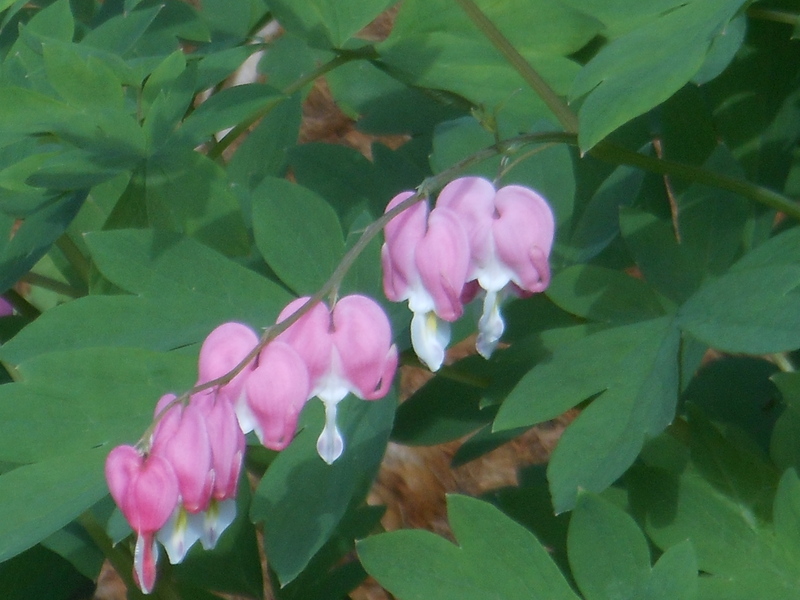 They seemed to call me to walk under their canopy, as their tiny, pink petals rained down upon me. The Crabapple trees were showering me with their colorful blessings! It was moment! I wish I could have captured that image for you through my camera lens. Crabapples, Redbuds, and Magnolias in bloom filled the south end of the park. 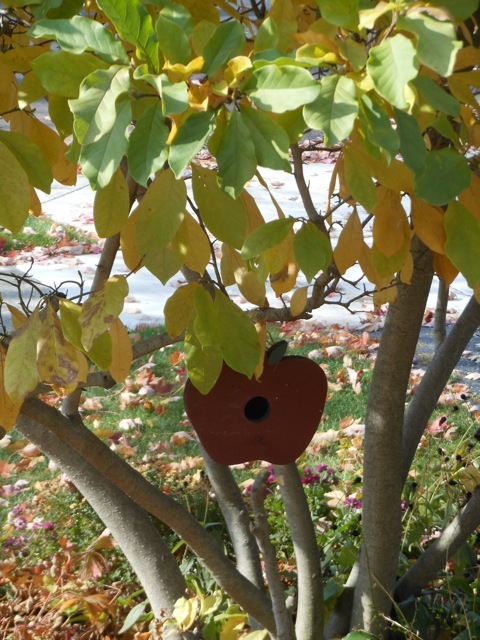 Their colorful branches guided me along the Friendship Walk, sprinkling their blossoms down onto the engraved pavers, filled with words of love and remembrance, along the garden path. 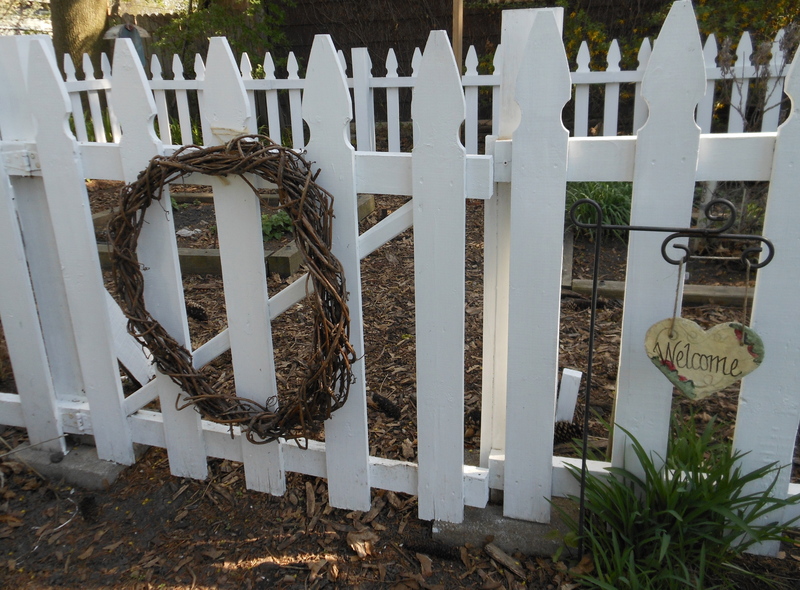 The Herb Garden was a quiet, peaceful place, as I looked around for signs of new growth among the herbs. 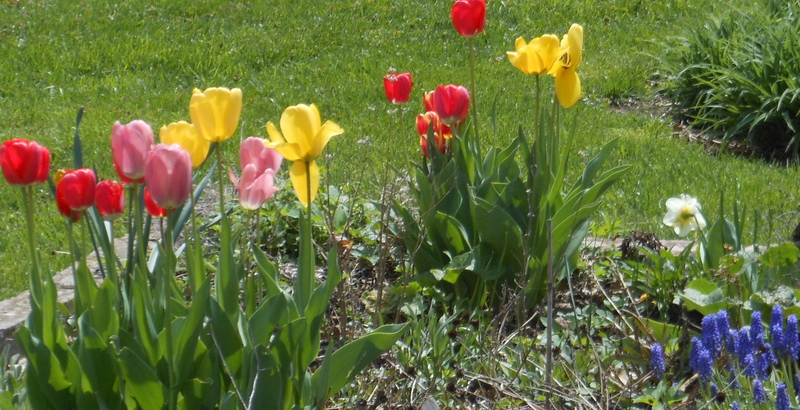 Beds of bright tulips encircled the Peace Pole in the garden. Under the white tent, a lovely setting for outdoor weddings, I giggled along with a group of preschoolers, as they frollicked in the soft, green grass. I carefully climbed upon huge, stone steps to visit the spring flowers blooming in a terraced bed nearby. Don’t the blossoms just make your heart sing on a gorgeous day like this? A quiet visit to the Veterans’ Memorial in the park reminded me of the sacrifices that our brave men and women and their families have given for all of us. Flags from each branch of the military waved proudly in the breeze as I walked amongst the granite sculptures dedicated to the Army, Navy, Air Force, Marine, and Coast Guard veterans. I was reminded of all the reasons why it’s so important to me to volunteer my time to support our military families. 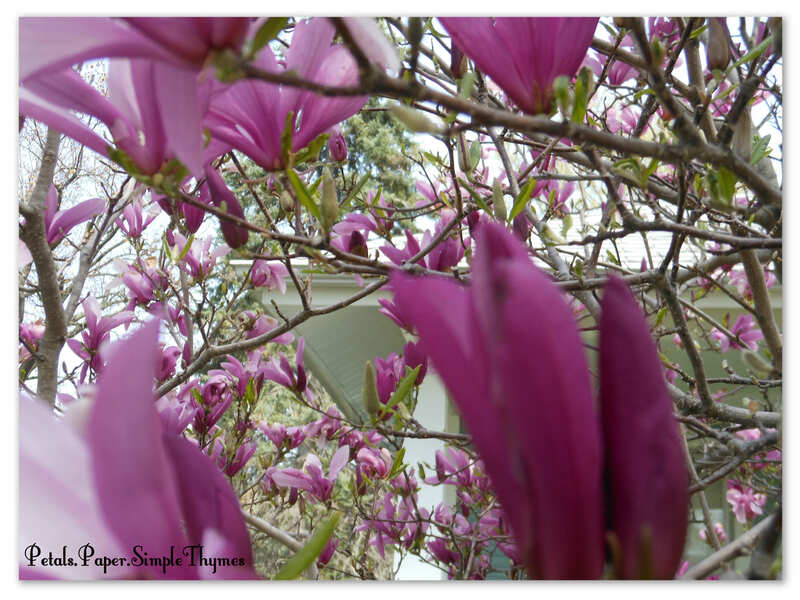 As I walked past the Mansion in the park, the Magnolia blossoms bobbed in the gentle breeze. The fountain splashed happily, surrounded by beds of colorful annuals. 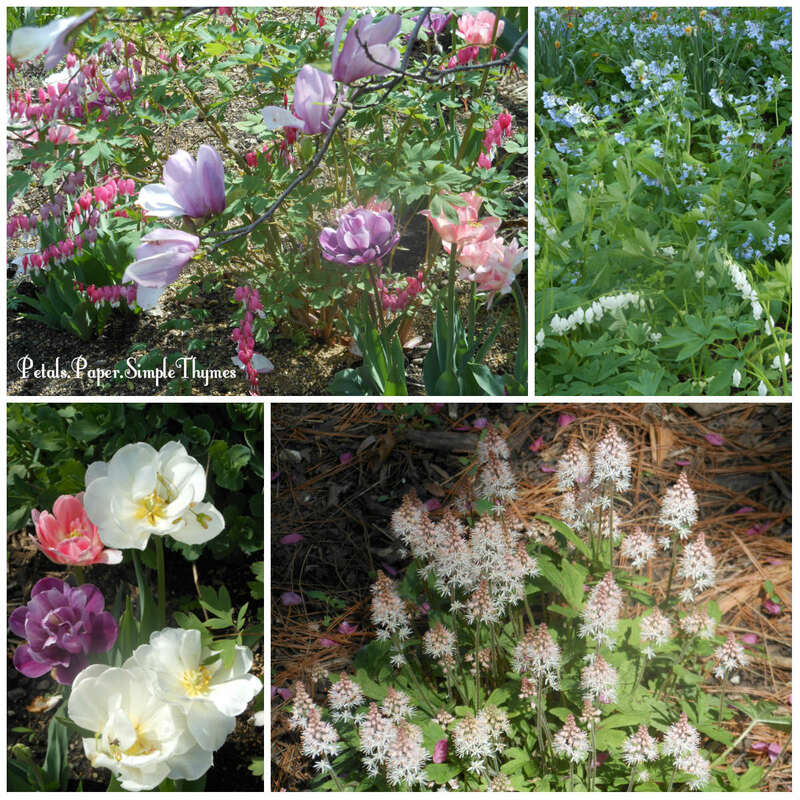 Although the flowers are very small now, they will fill these formal garden beds with lush color in the weeks to come. What an unexpected detour in my morning! I drove home with a full heart, counting my blessings out loud. Our warm, summer-like temperatures this afternoon were such a treat! With over an inch of rain this week, our garden is growing by leaps and bounds. Our Friendship Garden is changing daily. 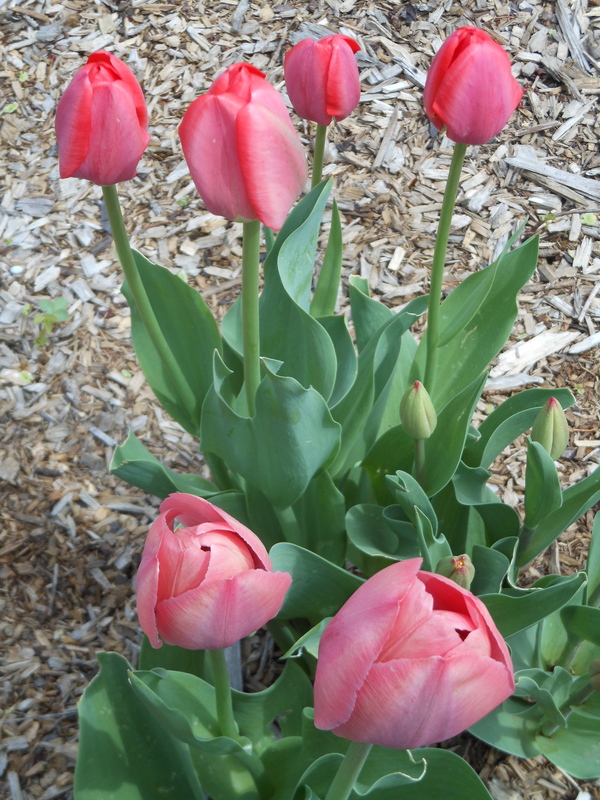 At the moment, bright, red tulips are blooming. The irises have large buds and the peonies seem to grow several inches overnight. The ants are busily crawling over the peony buds. It won’t be long until this very special perennial bed is in full bloom. You must come back soon to see it! My morning ‘to do’ list also took a detour. I had planned to head off to the garden center to pick out annuals, for the containers on the front porch and deck. 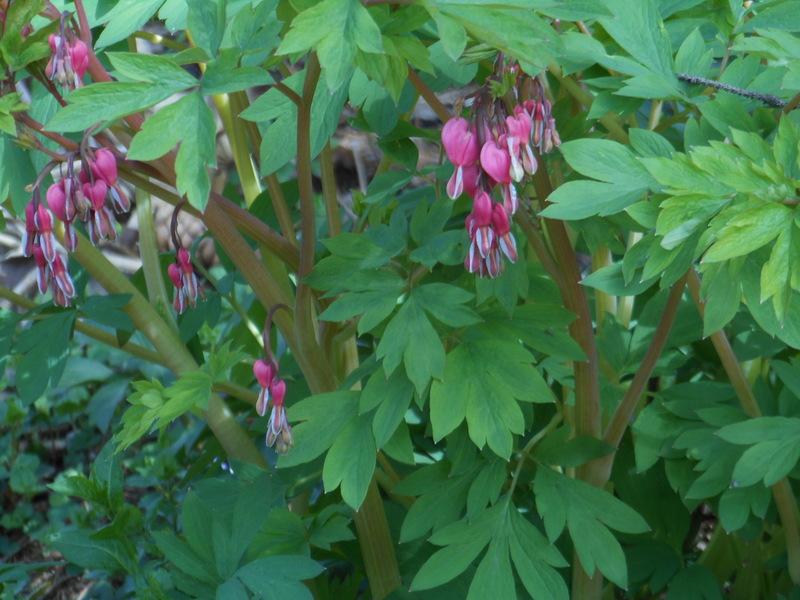 Instead I was totally content to wander through the garden… doing a bit of gardenkeeping here and there. (There is so much to do!!) I smiled as I watched a robin splashing in the birdbath, near our Herb Garden. 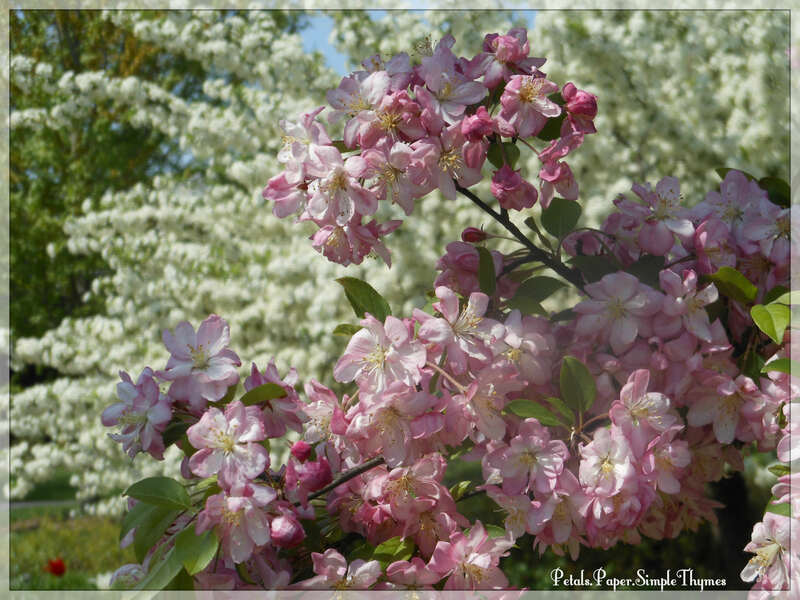 When I finally came inside late this afternoon, two pink Crabapple blossoms fell out of my hair and fluttered down onto the dining room floor. That’s when I knew I had to share this day with YOU! 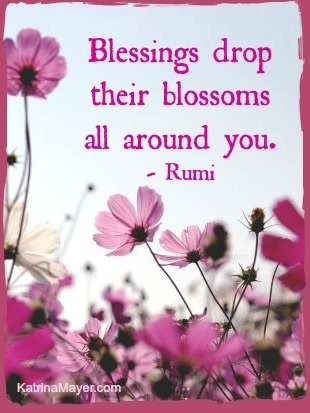 that drop their blossoms all around us. Thanks so much for stopping by today! I always look forward to our visits. P.S. What’s happening in your garden or nearby park this week? Hi Friends! What a wonderful welcome home! After a lovely summer-like visit with relatives in the Southwest, it was time to return home to springtime in the Midwest. 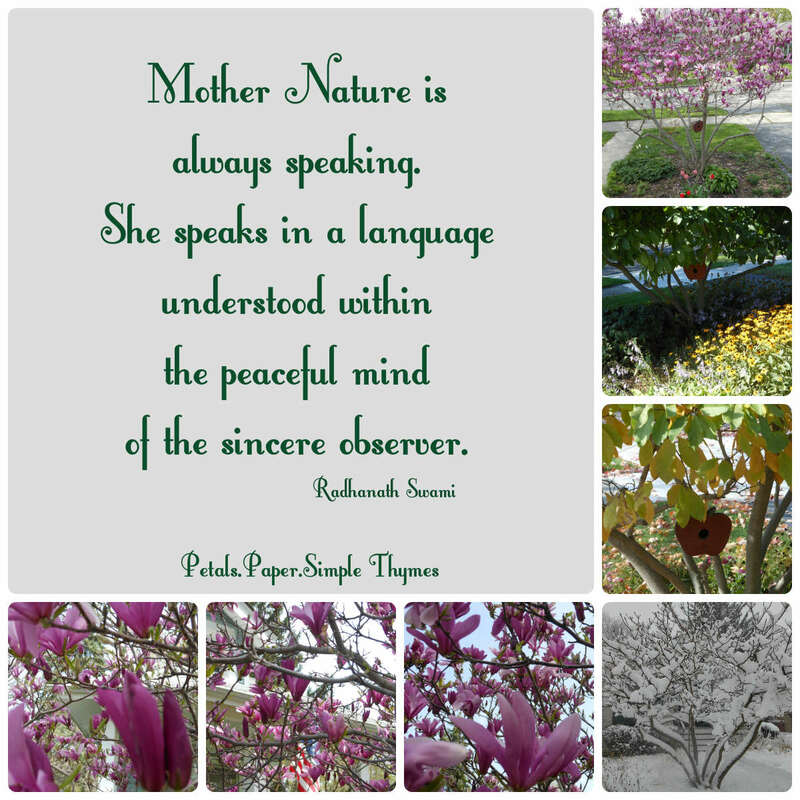 While we were away, I was curious about our Magnolia tree, near the front porch. Would we miss its bloom time while we were away? Since we arrived home late at night, the answer to my question had to wait until dawn. We were thrilled to discover our Magnolia tree in full bloom in the morning light! Bright and beautiful, the blossoms danced in the breeze under bright blue skies. Our Magnolia welcomed us Home, Sweet, Home in the happiest of ways! 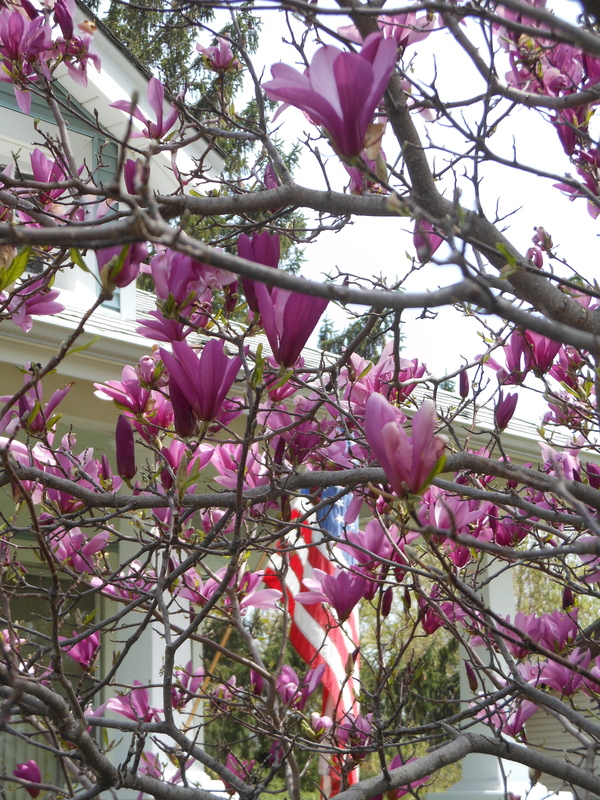 What a joy to see our Magnolia tree in full bloom! 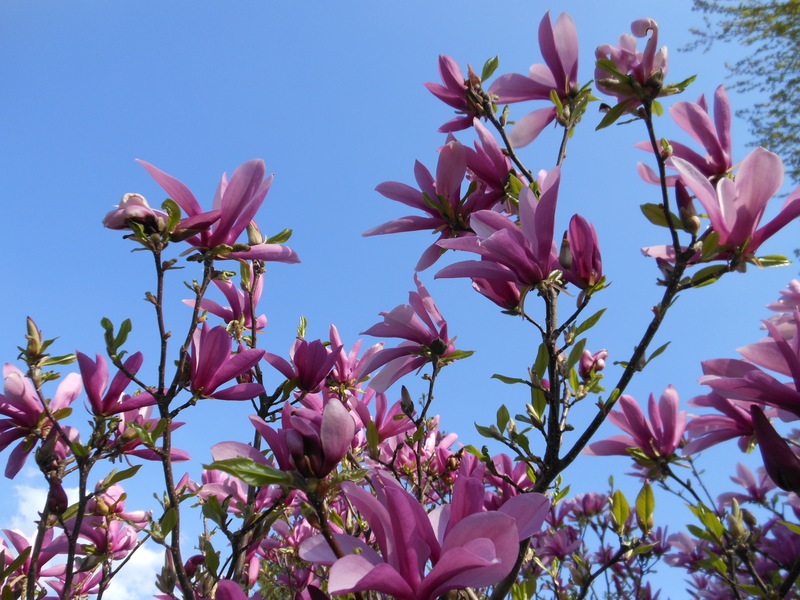 Our Magnolia tree is a very dear part of our garden. 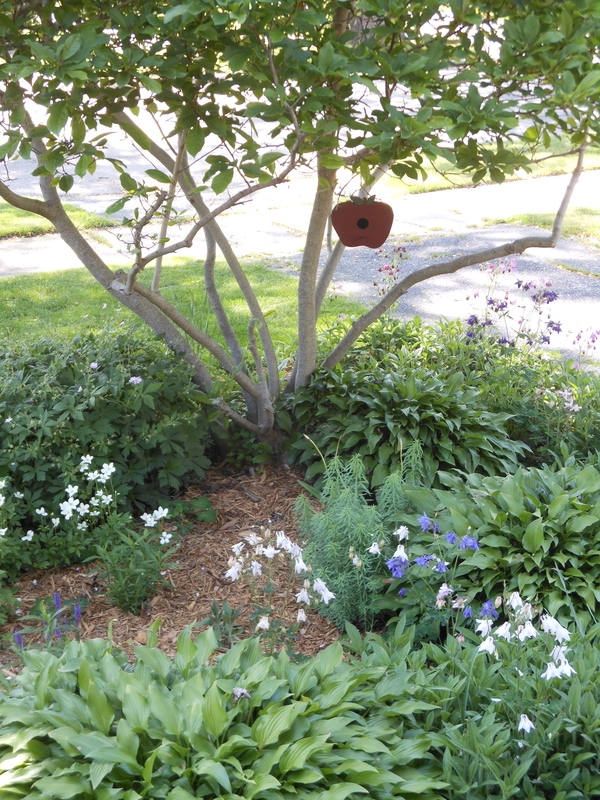 It was planted fourteen years ago, to replace an old Crab Apple tree that was no longer healthy. After admiring the Magnolias growing throughout town, I knew that it would be the next tree planted here. The day it was planted, it was only waist-high. It looked more like a bush! With patience, we happily watched our little tree grow to its mature height. 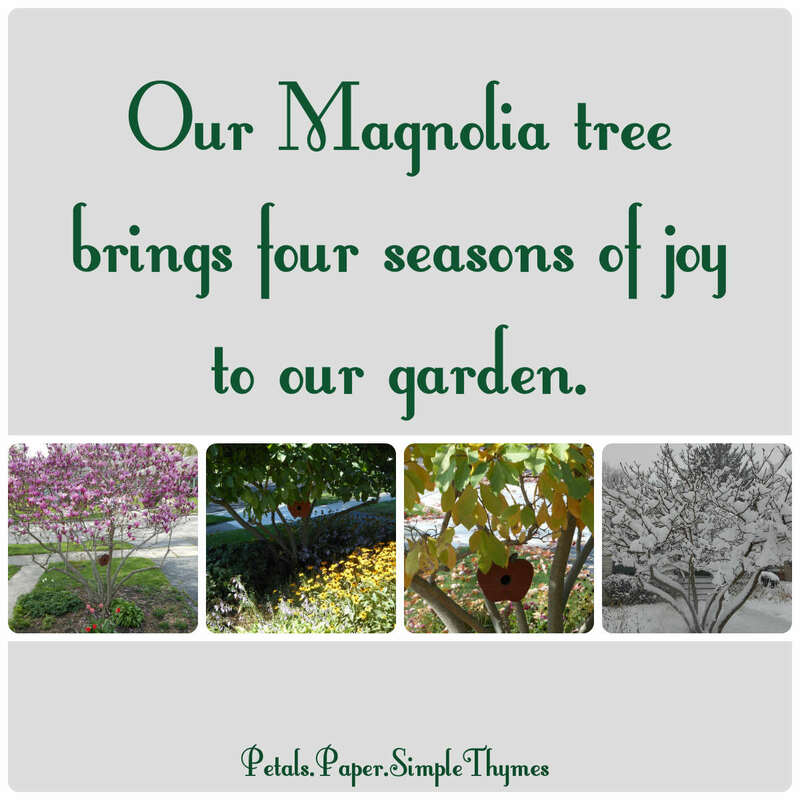 With just a bit of pruning of the lower branches each year, our Magnolia gives us so many gifts throughout each season. In the springtime, our Magnolia tree becomes a giant, fuchsia bouquet, flowering for a week or two, before its leaves appear. Throughout the summer, we are often surprised by more blossoms tucked amongst its leafy branches. We often discover a bird’s nest hidden in the Magnolia. 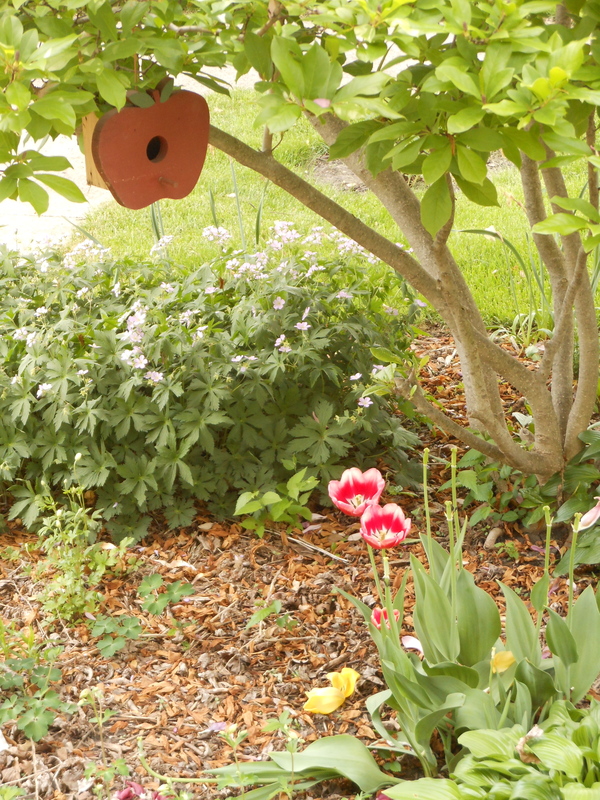 A birdhouse also offers shelter to our feathered friends. The perennial bed beneath the Magnolia tree adds an ever-changing splash of color throughout the entire growing season. Winter snows cling to the bare branches and the new buds for next year’s Magnolia blossoms. There is always something interesting to observe! 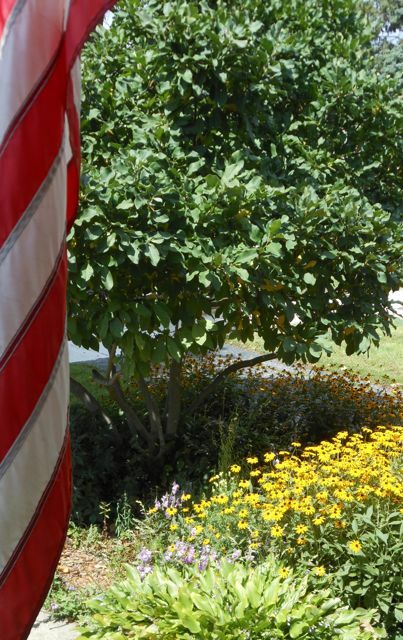 While reading on the front porch swing on a summer afternoon, our Magnolia provides the perfect bit of privacy. The birds sing its praises and the gentle breezes create a little dance among the leaves. On summer evenings, the Magnolia provides pleasant company as we watch sunsets from the front porch. National Arbor Day, celebrated on the fourth Friday in April, is the perfect time to think about all of the amazing benefits of planting trees. Planting times vary across the country, based on temperature and moisture conditions. Spring is a great time to plant trees in the Midwest and Northeast. In the Northwest, people often plant trees in the Fall. In the Southern states, trees are often planted in late winter. We recently watched the beautiful, animated short film ‘The Man Who Planted Trees.’ Based on a story by Jean Giono, this award winning film shares an optimistic tale of the importance of planting trees. It’s definitely worth watching here. This year, we are looking forward to planting dwarf, re-blooming Lilac trees (Syringa Bloomerang) in our yard. Just imagine lilacs blooming in the spring, and again from mid-summer to the first frost. I’m already dreaming of crocks filled with Lilacs on the front porch throughout the summer months! During our visit to the Phoenix area last week, one amazing tree captured my heart! 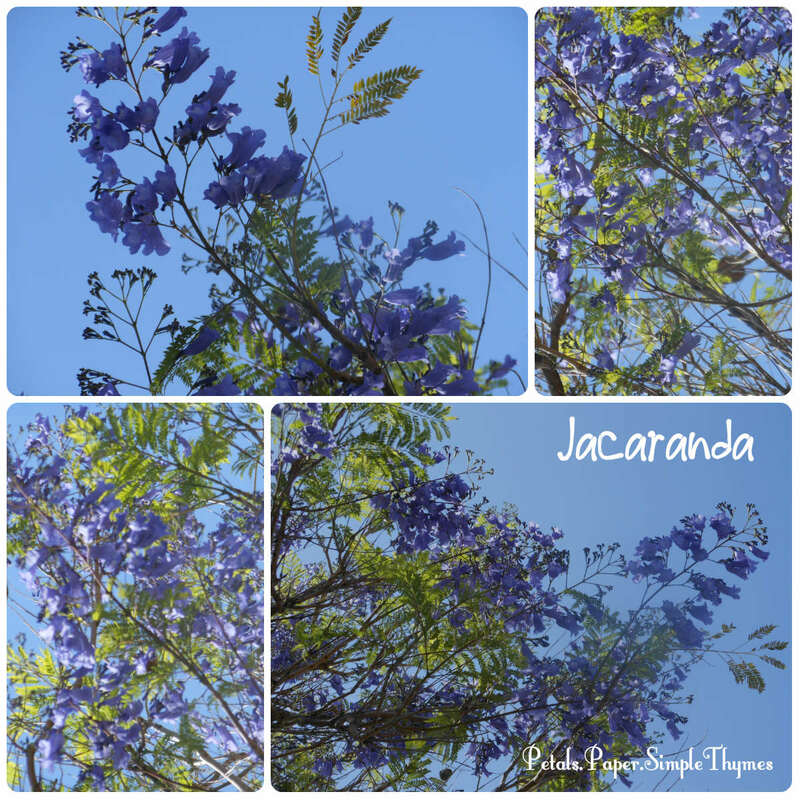 The Jacaranda tree thrives in warm climates with sandy soil. Its gorgeous purple panicles caught my attention everywhere we went. The Jacaranda tree could not survive our harsh Midwestern winters. So, I took lots of pictures so that I could ‘bring home’ the warm memories of this colorful tree! The Jacaranda trees were all in bloom in the Phoenix area last week. Their blossoms are just beautiful against the blue sky! Everywhere I look, there are trees in full bloom. What a joy! 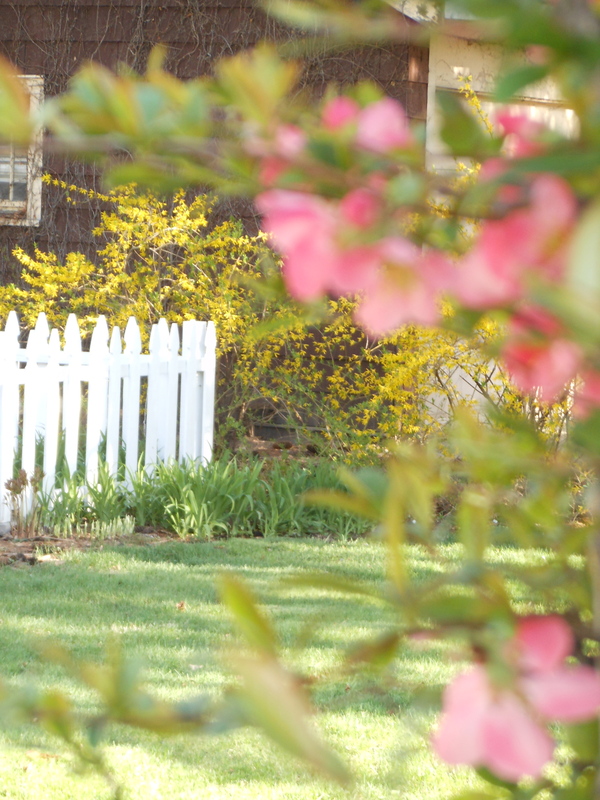 It is the perfect time to grab my camera and take a springtime walk through the neighborhood. I’m so happy that the recent rain and wind spared the blossoms. Take time to enjoy the trees today! 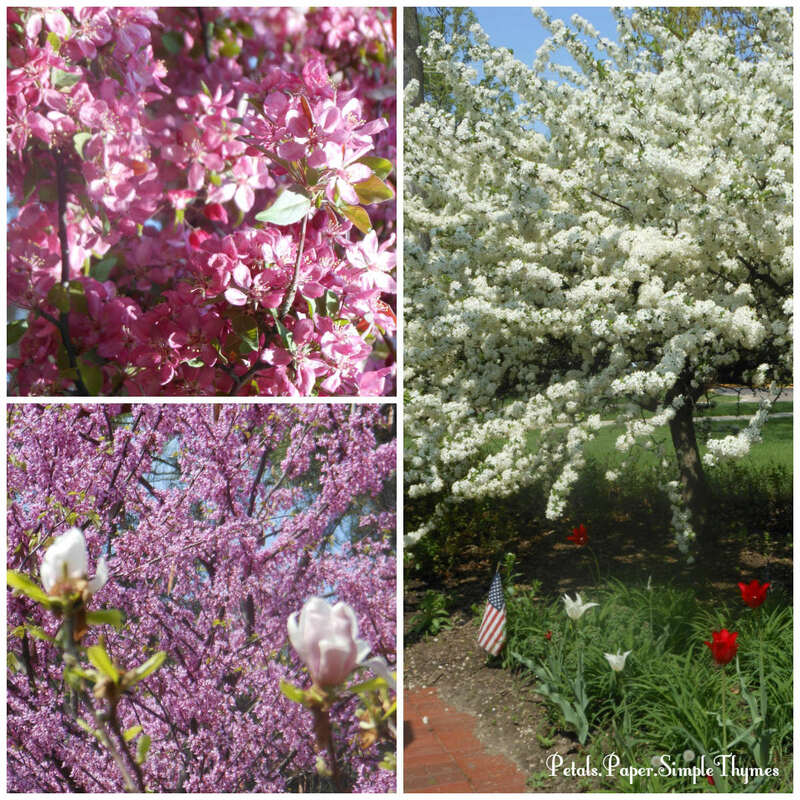 I hope you are enjoying springtime blossoms on the trees where you live, too! Which trees are your favorites? Which trees would you love to plant? Have a lovely day! I always enjoy our visits! Mary Engelbreit has captured my feelings perfectly today! Rabbit! Rabbit! Sending an abundance of good wishes as November begins! 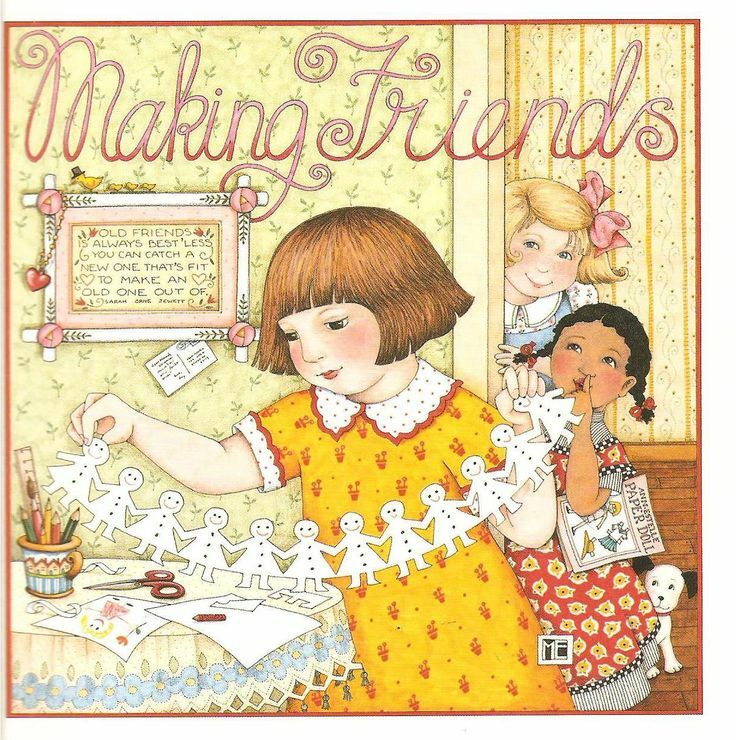 It’s the perfect time to celebrate all of the friends that gather here at our little blog! Some are dear friends that live nearby, while others are dear friends that live in other parts of the U.S., and in other parts of the world. Some are brand new friends that have already touched my heart in so many ways. 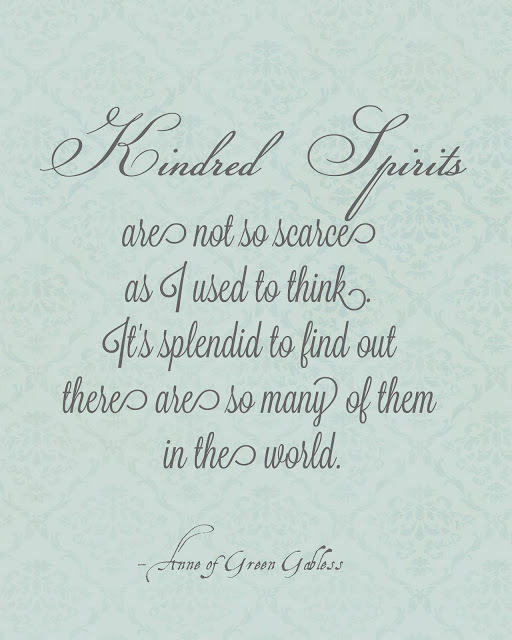 We are kindred spirits, one and all, and that is a wonderful thing to celebrate! The comments you leave each time you come to visit are such lovely gifts! Sharing our stories, encouraging one another, learning new things together, and sharing smiles makes it such fun to check in each day. I hope you can feel the joy of gathering here with friends, whether you are near or far. Our connections keep our friendships growing! Our friendships continue to grow and blossom here! and sharing your thoughts, too! 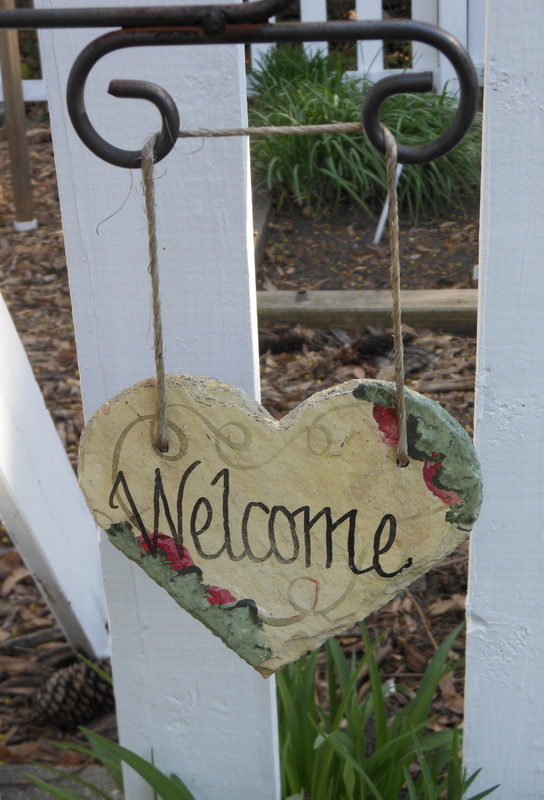 YOU make our little blog such a happy place to gather. with a little card ~ made just for you! 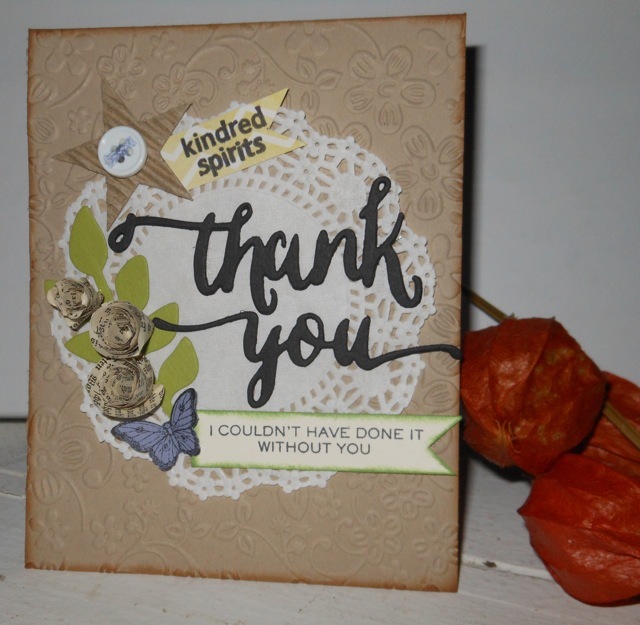 One of the joys of making cards is thinking about the special recipient the whole time that I am making their card. It feels almost like a little visit. As I made this card last night, I was thinking of ALL of the friends, old and new, who visit our blog. For our papercrafting friends: First I embossed SU ‘Crumb Cake’ CS with the Embossalicious ‘Florals’ EF, and distressed the edges with Distress ‘Tea Dye’ ink. Next I added a Wilton doily, and added the sentiment using Wplus9 ‘Hand Lettered Thanks’ dies and stamps. Then I embellished the focal point, using the SU Sizzlits ‘Little Leaves,’ the CTMH sentiment ‘Kindred Spirits,’ a CTMH corrugated star, button, and DMC floss. The paper roses were made from vintage pages of a German book. A butterfly from a SU punch was the finishing touch. and making our blog so much fun!